The Verdict: The Melbourne Hotel chicken parmigiana was really very good. How good you ask? Well half way during the eating of it I was wondering if this meal was a new leader in the quest for Brisbane’s Best Parma. Unfortunately the chips were a little disappointing which is the fault that cost this dish the “Robert Parma” Award. Chicken: The chicken piece on this dish was excellent. It had been well cooked, was well crumbed and was of a large size. It tasted great. Tomato Sauce: I can not fault the tomato sauce on this dish. It was very tasty, complimented the other elements of the dish well and provided a more than fair covering of the chicken piece. Ham: I feel like I am repeating myself here but again there is not much more I can say other than the ham was excellent. It was a large piece which covered the chicken and tasted great. Cheese: In what was, as has already been established, an excellent dish the cheese was the hero. I know it looks good in the photo but the photo doesn’t do it justice. It was perfectly melted and tasted great. Side dishes: Ignoring my usual complaint about the presence of a tomato wedge with my salad the Melbourne Hotel Parma’s salad was right out of the top drawer. It was fresh and well dressed. The chips, in the context of the remainder of the meal which was excellent, were a disappointment. They were a bit bland and definitely needed to be seasoned. Presentation: Plate size was a real factor with how this Parma was presented. The chicken piece was resting on some of the chips but that could have been resolved by a slightly larger plate. The Venue: The Melbourne Hotel is in Browning Street in West End. The downstairs bar is a large open plan space that has as its hub the bar with the TAB and Bistro built around it. My Parma was excellent value at $17. The Final Word: Of the Chicken Parmigianas I have tested thus far the Melbourne Hotel’s version is definitely in the top 5. The chips aside this was an almost perfect representation of what a pub Parma should be. I will definitely be back for another Parma at the Melbourne! 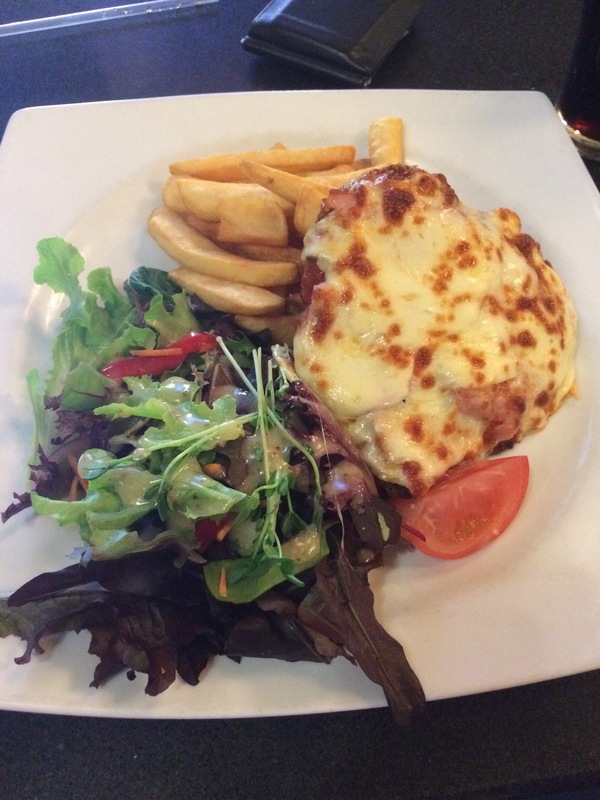 This entry was posted in Uncategorized and tagged Brisbane, brisbane's best parma, chicken, chicken parmigiana, the Melbourne Hotel. Bookmark the permalink. worth adding Beach House CBD to your list.